Skiing is my favourite holiday. The fresh air, scenery and exercise give you a very different experience than your typical beach holiday….but there’s a problem. Working out which resort to head to and planning the trip is a nightmare. Hours of searching Google, lots of phone calls to check availability and never quite knowing if there isn’t a better fit or a better deal elsewhere is exhausting. Luckily a new start-up is looking to shake things up this winter…introducing Mountago. Mountago aims to help skiers and snowboarder share their experiences, hints and tips on the best places to go in the Mountains. To do this, the site offers profiles of hundred of ski resorts across the globe showing with a simple system for other skiers and snowboarders to add a reviews for a resort including rating specific aspects of it such as terrain and suitability for different levels of skier or boarder. Each person who adds has their own profile so you can see where they have been and follow people you know of like. Sounds good? It gets better. For each resort the site also shows accommodation, bars and restaurants, ski schools, ski hire and much more, allowing people to find the right resort from them and then work out the best places to stay, eat and party! Places are added by users, so get involved and add your favourite places to the site! So this all sounds great and something that is missing from the market so we thought we’de give it a go…. We put in our needs, a short transfer, ski in – ski out and good value and let the site go to work. 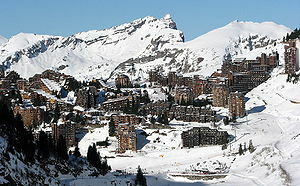 The top suggestion was Avoriaz. We’ve skied in Avoriaz before and it was truly fantastic, the skiing in Avoriaz is varied and is to the door, the transfer is short, just one hour and the value for money is good. The site showed us lots of options for accommodation, bars, restaurants, ski schools and more and did exactly what it promised. So, if you’re looking to hit the snow this winter check out Mountago for the easiest and most social way to plan your trip!